In a blink of an eye, we have reached the half way run of the North Face Trail Run series. This time round we were back at the Bukit Timah Nature Reserve but instead of starting at the overly congested Bukit Timah Visitor Centre, we choose to start off from Dairy Farm Car Park B. 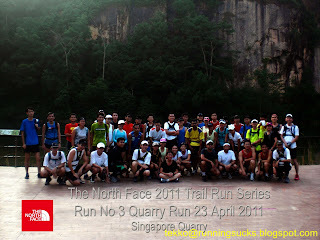 After a short briefing, the runners took off towards the Singapore Quarry. The distance we were supposed to cover was about 10km, kept short in view of the more "challenging" route. Just after a few hundred metres, we started ascending a slope going up and up till we came to the first of our stop - the Singapore Quarry. Most of the runners have not been here before and were dumbfounded by the beauty of the quarry. One guy even exclaimed in mock surprise - "Is this Singapore?" After a short stop for photo taking, we resumed the run and entered a mountain biking trail. It was single file running most of the way with lots of mud and cyclists to avoid. There was even a steep staircase sort of bridge to cross. Just like a scene out of those Indiana Jones movie. The trail meander through the forest before we eventually wound up at the carpark of Bukit Timah Visitor Centre. From there, it was a short run to the next stop, the Hindhede Quarry, another picturesque destination but not before the runners have to cross a small rope bridge. Another scene right out of the movie! After a short water and toilet break at the Bukit Timah Visitor Centre, came the toughest part of the run, the ascend up to the summit of Bukit Timah. Almost everybody slowed to a walk on the "unrunnable" slope. Fortunately for everybody, we took a turn 3/4 up and enter the dark and mysterious Catchment Path, a steep descending trail of steps and roots. And the series claimed it first victim when a girl fell and sprained her ankle cutting short her run. And then it was bright sunlight again as we entered into the by now familiar Pipeline Trail, a long undulating route that seems to stretch forever. But end it must and the runners finally exited the Pipeline Trail to enter the Belukar Trail. From there, it was a short 2 km to the junction of Petir Road and Chestnut Ave before the runners u-turned to go back to the start point. There the runners were greeted by the 2 lovely ladies from the North Face shop who gave each runner a small token of appreciation for participating in the run. I hope everybody had enjoyed the run despite the short distance. This series of run was conceived not for the elite runners but for recreational runner hoping to try something new, explore new running grounds and in the process make new friends while enjoying the view and the run. So runners turning up expecting a good hard run or personal race and PBs will be disappointed. Likewise, participants who have never run more than 10km on road in recent times will not be able to manage the slightly more challenging nature of the trails. The next run will be a longer distance of at least 15km through a part of the Bukit Timah and Pierce reserve that most runners do not know exist. Look out for the sneak preview coming out soon!